We come to a curious installment on this list of the Top 50 releases of 1983 as for the first time we are dealing with a re-release of an older film. I considered skipping The Rescuers since it was originally released in 1977 but thinking back on why I started this project, which was to re-create the 1983 movie-going experience, I decided ultimately to include it. I’ve been unable to find any further background regarding this (if you have any information, please drop some knowledge on me in the comments section below) but Disney’s theatrical strategy for the year 1983 appears to be fairly simple: money for old rope. Disney re-released three of its previous hits in 1983 (Robin Hood, Snow White and the Seven Dwarfs and The Rescuers), usually pairing the films with a new animated short (in the case of The Rescuers it was Mickey’s Christmas Carol). There are a few likely reasons behind this strategy. Firstly, the home video market in 1983 was still in its infancy and for many Disney fans a re-release was their only opportunity to see some of their favorite classics again. Secondly, with the exit of the original crew of Disney animators following The Rescuers, the new Disney crew was having a bit of trouble creating the same kind of magic that their predecessors had managed to turn out on a regular basis. Disney’s releases throughout the 80’s releases were certainly never major financial disasters but they failed to capture audiences and critics in the same way that so many of the great ’60s and ’70s Disney films had and perhaps the folks in Burbank were beginning to get just a little bit concerned about maintaining the integrity of the Disney brand. Whatever the reasoning, Disney’s strategy paid off as its three re-releases dominated the G-rated movie market in 1983. The Rescuers raked in $21 million and finished second among G-rated releases behind its older sister, Snow White (more on her in a few months, I guess). 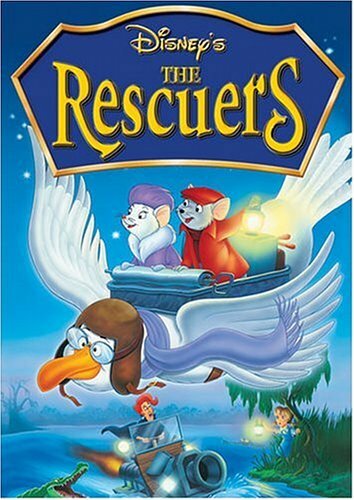 While it ranked as a major success for Disney both during its initial release and its 1983 re-release, I think it’s safe to say that The Rescuers doesn’t appear to hold the same cache today among fans of the Disney Animated Classics. Most of us could sing a song from or recite a line or two from One Hundred and One Dalmations, The Jungle Book or Robin Hood but does anyone out there really have a distinct, specific moment from The Rescuers that sticks out in your mind? That’s not to say that it’s an unenjoyable film while you’re watching it, just that it doesn’t seem to have the same resonance that some of its Disney brethren have. The heroes are likable enough, two mice named Bernard (Bob Newhart) and Miss Bianca (Eva Gabor) set out on a mission to rescue an almost unbearably cutesy little girl named Penny. Bernard and Miss Bianca work for the Rescue Aid Society, a sort of mouse version of the United Nations complete with ever-so-slightly offensive Asian mice. Penny is an orphan who has been kidnapped by Madame Medusa (voiced by Geraldine Page in her most menacing role until Interiors), a pawnshop owner who needs a small child to fit down a whole in the Louisiana bayou so she can obtain a fantastic jewel called the Devil’s Eye. It’s not a premise we dwell on for very long as essentially the point is that Madame Medusa is putting the girl’s life at risk and doesn’t care. Madame Medusa has her fun moments but as Disney villains go, I’m betting she’s one of the least recognizable today. I suspect that’s because there’s not much originality to her. She’s basically a slight variation on Cruella de Vil, arguably one of the greatest and most memorable of all the Disney villains. Disney animators were initially considering using Cruella as the villain in The Rescuers, an idea that was ultimately shunned out of a desire to avoid producing sequels. Frankly, I think it would have been a good idea but I appreciate Disney’s desire to create something new, something studios certainly don’t bend over backwards to do these days. Plot-wise, The Rescuers just feels a lot like its main villain, largely unoriginal and cobbled together with elements from previous Disney movies. It’s a fun ride but you’re left in the end feeling that you haven’t really seen anything new. One thing that is rather original about the film is the opening sequence, a rather artfully put together montage of canvas paintings set to the film’s theme song “Who Will Rescue Me”. The song is pretty corny but the visuals are very interesting and unlike anything I remember seeing in other Disney films. I wish I was going to get a chance to review an original Disney film from 1983 rather than a re-release because it would give me a better feel for what kind of content Disney was really producing during that era. As it is, I have to be content watching a film that I’m sure a lot of people enjoyed revisiting in theaters but that just doesn’t hold up as a particularly memorable film years later. Next Up: The second Stephen King adaptation on our countdown, Christine.